No Stiletto Shoes ... plus! 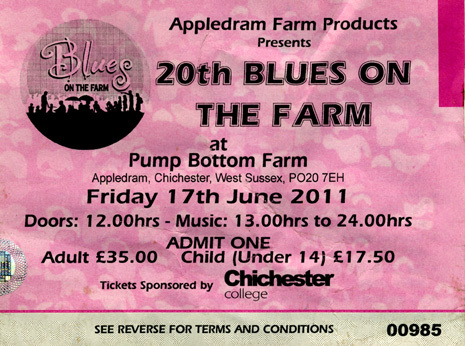 Blues on the Farm looked set to be transformed into Blues in the Bog, following a day of relentless rain. Bands were delayed, yet the enmired audience remained sweet ... the beer tent was not affected! Sadly (thanks to the tempest) your correspondent missed the Bareknuckle set feat. Josh Phillips earlier in the evening ... Running-order was changed so The (headlining) Shoes didn't actually close the show ... (they had all got there in good time so they went on penultimately). They played without soundcheck and Graham Ewins (armed with his preset soundboard card) got the complex ensemble under sonic control very quickly. The infectious humour and superb, exciting and tasteful playing soon had the crowd in the very best of moods. Luckily the stage was in a marquee, but in any case the rain held off while GB, Andy and friends ... and the excellent Never the Bride ... were playing. 'Lo! Fair weather', one might say. 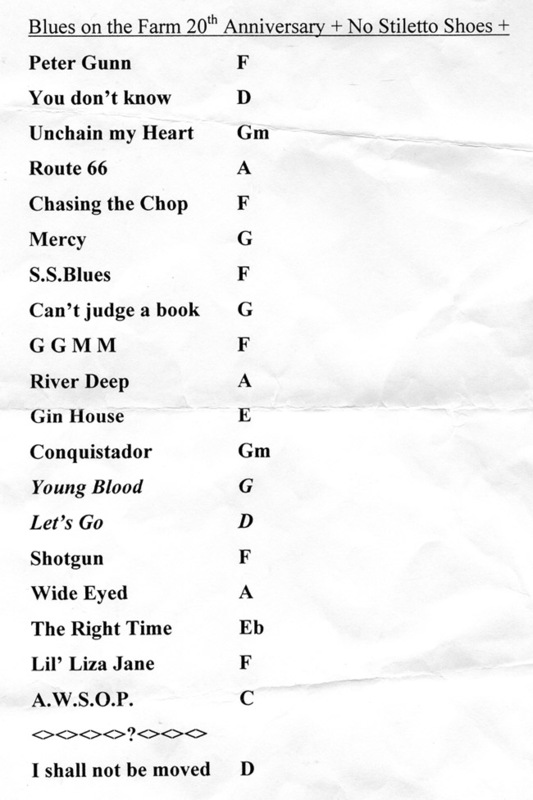 As the setlist below (culled from the stage) indicates, the proposed running-order was modified, partly by omission, partly by re-ordering (though no consecutive songs were in the same key even so). 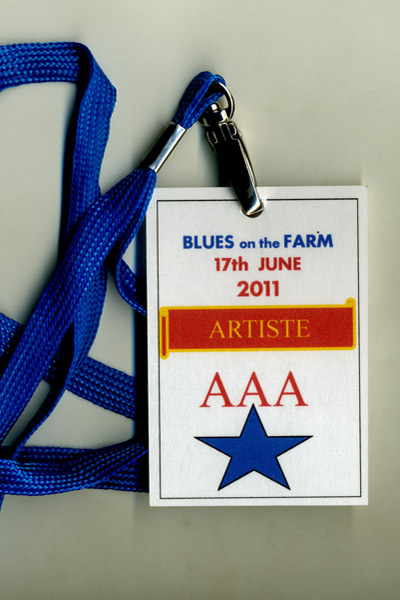 All bands were required to play curtailed sets (Never the Bride can't have played more than five songs) in order that musicians arriving late because of the terrible weather could still be accommodated. With this regime in mind we are lucky to have lost only three Shoes pieces. Note that six of the songs emanate from composers in the band, and the rest are 'standards'. Interesting to note how the typist (perhaps Gary himself?) abbreviates Good Golly Miss Molly, a respected tune from his teens, in the same way that Procoholics allude to A Whiter Shade of Pale as AWSoP ... which he also does, albeit with dots.